The fruits of their conversations can be seen in the digital series “Boiling the Frog with Senator Al Franken.” Their talks run the gamut from serious to funny as they take on everything from coal and carbon prices to Letterman’s retirement beard in the six 5-minute shorts that begin rolling out Monday on funnyordie.com and its Facebook page with a new installment each week. For Sen. Franken, it’s an effort to “fight back” against the creeping apathy and disregard toward science and climate change. 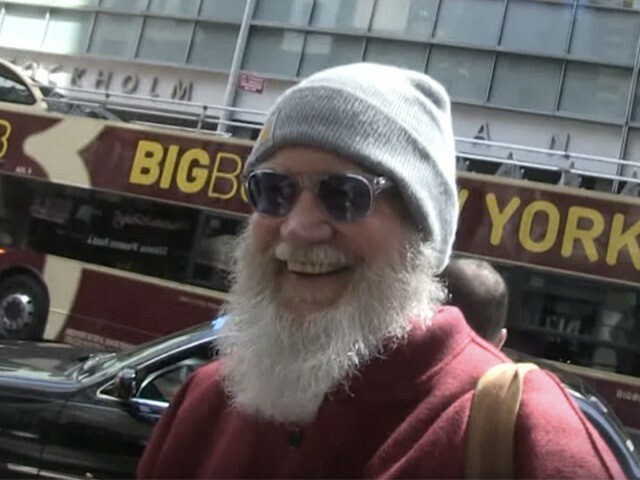 Letterman recently did an episode of “Years of Living Dangerously” in which he traveled to India to learn about what the country is doing about power and climate. “He gives me hope, he gives me faith,” Letterman said. Letterman also spoke to The Associated Press about late-night television in the Trump era and jokes about the president that cross the line. The remarks have been edited for clarity and brevity. AP: What do you hope to accomplish with this series? Letterman: To me, people ought to be aware of this, people ought to have this tucked in their wallet. People ought to walk around with this every day in the back of their mind and people ought to be aware and be educated and looking forward to things that they might do to help their kids and their children’s kids. I think it’s better in that regard than it used to be — the current administration notwithstanding. When you travel places and I know in California the same thing is true, you see enormous solar installations, you see enormous wind farms that 10 years ago did not exist. I am aware firsthand through traveling here and abroad that people are aware of this and doing things about it. AP: Speaking of the current administration, late-night seems to have become mostly Trump jokes and tirades. Do you miss not being part of that? Letterman: Here’s what I keep saying: We know there’s something wrong, but what I’m tired of is people, daily, nightly, on all the cable news shows telling us there’s something wrong. I just think we ought to direct our resources and our energies to doing something about it. And other people have made this point: If the guy was running Dairy Queen, he’d be gone. This guy couldn’t work at The Gap. So why do we have to be victimized by his fecklessness, his ignorance? But it’s just the behavior is insulting to Americans, whether you voted for him or not — and I feel bad for people who did vote for him because he promised them things that they really needed and one wonders if he’s really going to come through. I know there’s trouble in this country and we need a guy who can fix that trouble. I wish it was Trump, but it’s not, so let’s just stop whining about what a goon he is and figure out a way to take him aside and put him in a home. AP: Sen. Franken had been critical of Kathy Griffin for how she spoke out. Do you think she took it too far? AP: In one of the episodes you tell Sen. Franken that you’re constantly looking for a version of his life where what you do is truly meaningful. Do you feel like you’ve been able to accomplish that in your retirement? Letterman: No, no, and it frustrates me. I’ll tell you the climate situation and gun control makes me crazy. And the fact that 30 million people in this country are hungry every day. The answer to your question, the long and the short of it, is no, and I find it deeply, deeply frustrating. That’s why I would do anything with Al, I would go anywhere with Al. Because on the other hand, I always wondered about what it looked like when a celebrity got up and talked about people who didn’t have shoelaces, but it’s killing me. And I think Al to a certain extent felt that same frustration. He’s figured out a way to do it and it’s been successful. And the guy is superfunny, superintelligent and the integrity just seeps out from under his door. And one more thing: If Nat Geo or anybody else would like a project and they need a stooge, I would be first in line.